Note: * Captain Marvel ia a registered trademark of The Marvel Comics Group used with permission. One of the more remarkable aspects of Stan Getz's 1972 masterpiece is just how organic he was able to keep the sound. The band surrounding Getz on this Columbia date was led by Chick Corea with his Return to Forever (electric) bassist Stanley Clarke, drummer Tony Williams, and Brazilian master percussionist Airto. With the exception of Clarke, all the rest had played with Miles Davis in his then-experimental electric bands. Corea's Return to Forever was just getting itself off the fusion ground, while Williams had been with John McLaughlin and Larry Young in Lifetime on top of his experience with Davis. But make no mistake, this is a Stan Getz record, his gorgeous tenor tone furiously and fluidly playing through all of Corea's difficult changes on Corea's Latin carnival jam, ''La Fiesta,'' and shapeshifting his way through mode changes on ''Five Hundred Miles High.'' The nucleus for the bedrock of Return to Forever was in the Getz laboratory of extended complex harmony and a strict adherence to melodic improvisation. Billy Strayhorn's ''Lush Life'' is the space in which Getz teaches the band about dynamic, texture, and ambience -- he even has Clarke bowing his bass. This band, combining as it did the restlessness of electric jazz with Getz's trademark stubbornness in adhering to those principles that made modern jazz so great, made for a tension that came pouring out of the speakers with great mutual respect shining forth from every cut -- especially the steamy Latin-drenched title track. 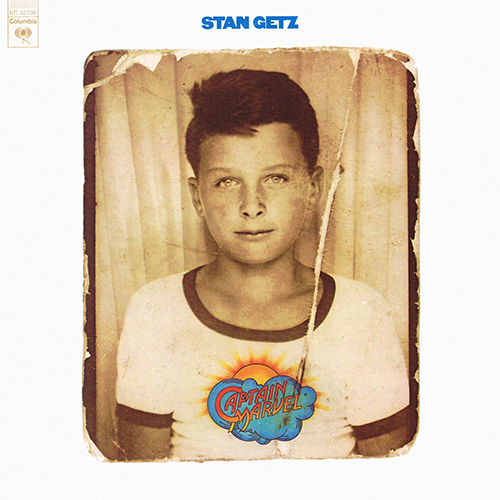 Captain Marvel is arguably the finest recording Getz made during the 1970s. One of the all-time great tenor saxophonists, Stan Getz was known as ''The Sound'' because he had one of the most beautiful tones ever heard. Getz, whose main early influence was Lester Young, grew to be a major influence himself, and to his credit he never stopped evolving. Getz had the opportunity to play in a variety of major swing big bands while a teenager due to the World War II draft. He was with Jack Teagarden (1943) when he was just 16, followed by stints with Stan Kenton (1944-1945), Jimmy Dorsey (1945), and Benny Goodman (1945-1946); he soloed on a few records with Goodman. Getz, who had his recording debut as a leader in July 1946 with four titles, became famous during his period with Woody Herman's Second Herd (1947-1949), soloing (along with Zoot Sims, Herbie Steward, and Serge Chaloff) on the original version of ''Four Brothers'' and having his sound well-featured on the ballad ''Early Autumn.'' After leaving Herman, Getz was (with the exception of some tours with Jazz at the Philharmonic) a leader for the rest of his life. During the early '50s, Getz broke away from the Lester Young style to form his own musical identity, and he was soon among the most popular of all jazzmen. He discovered Horace Silver in 1950 and used him in his quartet for several months. After touring Sweden in 1951, he formed an exciting quintet that co-featured guitarist Jimmy Raney; their interplay on uptempo tunes and tonal blend on ballads were quite memorable. Getz's playing helped Johnny Smith have a hit in ''Moonlight in Vermont''; during 1953-1954, Bob Brookmeyer made his group a quintet and, despite some drug problems during the decade, Getz was a constant poll winner. After spending 1958-1960 in Europe, the tenor man returned to the U.S. and recorded his personal favorite album, Focus, with arranger Eddie Sauter's Orchestra. Then, in February 1962, Getz helped usher in the bossa nova era by recording Jazz Samba with Charlie Byrd; their rendition of ''Desafinado'' was a big hit. During the next year, Getz made bossa nova-flavored albums with Gary McFarland's big band, Luiz Bonf�, and Laurindo Almeida, but it was Getz/Gilberto (a collaboration with Antonio Carlos Jobim and Jo�o Gilberto) that was his biggest seller, thanks in large part to ''The Girl from Ipanema'' (featuring the vocals of Astrud and Jo�o Gilberto). Getz could have spent the next decade sticking to bossa nova, but instead he de-emphasized the music and chose to play more challenging jazz. His regular group during this era was a piano-less quartet with vibraphonist Gary Burton, he recorded with Bill Evans (1964), played throughout the 1965 Eddie Sauter soundtrack for Mickey One, and made the classic album Sweet Rain (1967) with Chick Corea. Although not all of Getz's recordings from the 1966-1980 period are essential, he proved that he was not afraid to take chances. Dynasty with organist Eddie Louiss (1971), Captain Marvel with Chick Corea (1972), and The Peacocks with Jimmy Rowles (1975) are high points. After utilizing pianist Joanne Brackeen in his 1977 quartet, Getz explored some aspects of fusion with his next unit, which featured keyboardist Andy Laverne. Getz even used an Echoplex on a couple of songs but, despite some misfires, most of his dates with this unit are worthwhile. However, purists were relieved when he signed with Concord in 1981 and started using a purely acoustic backup trio on most dates. In 1987, Getz had a large tumor removed from behind his heart. Subsequent tests revealed that he had liver cancer and cirrhosis, most likely due to years of substance abuse. Undeterred, Getz embarked on a strict, herbal-based diet hoping to treat the lymphoma. By fall 1988, MRI scans revealed that the tumor had dramatically shrunken in size. Buoyed by the good news, Getz remained active, touring with pianist Kenny Barron and recording the albums Apasionado (1990) with Herb Alpert and You Gotta Pay the Band (1990) with vocalist Abbey Lincoln. Sadly, Getz's cancer never fully abated and he died on June 6, 1991 at age 64. His final recording, 1991's People Time, is (despite some shortness in the saxophonist's breath) a brilliant duet set with Barron.